Circa 1922. Named for the trout-filled Elkhorn Creek that runs behind the inn, this historic Italianate brick building with archways and a balcony on the Coal Heritage Trail has been lovingly restored by Dan and Elisse. Period antiques and 1930s furnishings complement an international art collection. Paintings, prints, ceramics, stained glass, sculpture and textiles are for sale. 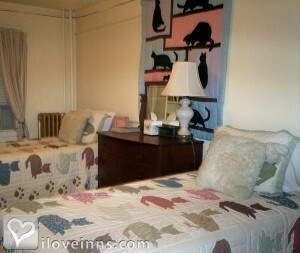 Stay in a guest bedroom or suite with handmade vintage quilts, clawfoot tubs and bubble baths. A family suite with two adjoining rooms is available. Alto Grande Coffee, offered exclusively at the inn, accompanies a continental breakfast. Located near Pinnacle Rock State Park and Panther State Forest, there are ATV and bike trails on Burke Mountain. 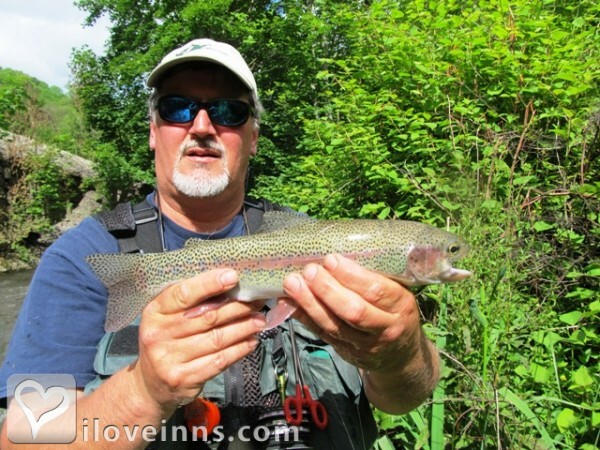 McDowell County is also a popular hunting and fishing area. Payment Types Accepted Include Master Card, Travelers Checks, Discover, Visa and PayPal. This property has 14 total guest accommodations, 10 with fireplaces, 4 with hot tubs, 1 two-bedroom suite. The types of beds available include Queen, King, Double and Twin. Well-behaved pets are welcome, but please call first. $25 pet cleaning fee per room/per stay. All pets must remain leashed on inn properties. Guests are 100% responsible for their pets and 100% financially responsible for any damages their pets may do. Antique, clawfoot bathtubs (and bubble bath! 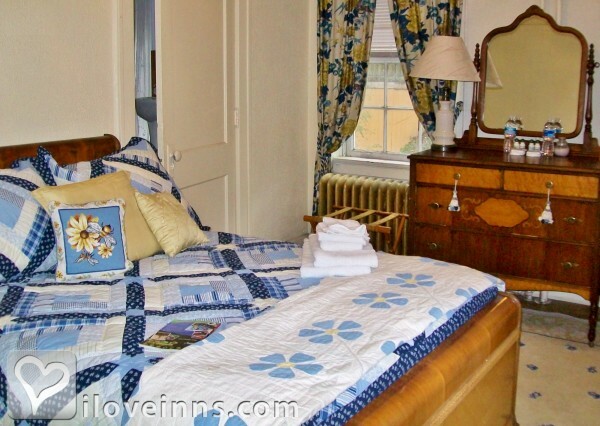 ), the European-style balcony and fireplace lounge, and the fine art, vintage quilts and Italian lighting fixtures decorating the Inn all combine for a lovely, romantic ambiance. Dan and Elisse saved this historic building and lovingly restored it - and if that's not romance, what is? We recycle, reuse, & repurpose- & have since WAY before being "green" was cool! 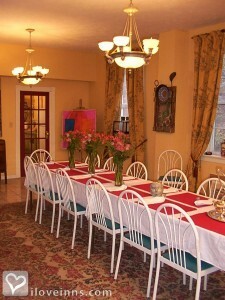 We saved and restored the Inn- "repurposing" a coal miner's clubhouse into both our home and our historic inn! Chef Dan makes pesto and other delicious things from our garden's harvests, and guests are always welcome to pick and enjoy anything in season. The Inn has a flower and vegetable garden; guests are welcome to pick veggies in season, and Chef Dan make pesto and other delicious treats for our dinner and lunch guests from our garden harvests! We truly have all four seasons here: tulips & daffodils in the spring, green mountains with lilies and sunflowers in the summer, and the mountains are Gorgeous during "leaf-peeping season", all the way through the end of October! Well-behaved children are always welcome! Reservations held with a major credit card. One-week notice required for full refund, two-week notice required during holidays and festivals. Featured on HGTV's "Building Character" & "ReZoned" programs, the "Coal Heritage Trail" Elkhorn Inn was designed by the region's preeminent architect, Alex Mahood, and built in 1922 by Empire Coal and Coke Co. as their "Miner's Clubhouse". 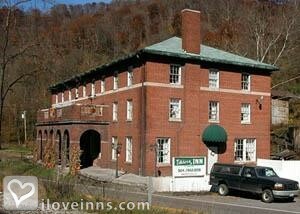 The Elkhorn Inn is on West Virginia's "Coal Heritage Trail", and Dan Clark was awarded the 2008 Historic Preservation Award by the Coal Heritage Trail/America's Byways for his saving and restoration of the last surviving historic property in this area. Kimball WWI Memorial for Black Soldiers (2 miles), Bramwell restored train station/museum & "Coal Baron Mansions" (8 miles), Coalwood of "October Sky" and "Rocket Boys" book and movie fame (6 miles), Welch of "The Glass Castle" book and movie fame, and the Mine Wars (8 miles), the historic Kimball Coal Company Store (3 miles), the restored, historic Ashland Company Store, now a grocery and shop (8 miles). 2017: Winner: SCORE Business Champion for West Virginia. WV Tourism Division "Stars of the Industry" 2006. BedandBreakfast.com Marketer of the Year Runner-Up, 2014. The dates this property will honor the certificate are Anytime, subject to availability, not valid Oct. 1-10. This is a classic Italian Caprese salad, but served on Himalayan Salt Plates, which give a lovely, delicate saltiness, while adding beauty! Chef Dan\'s Pumpkin-Mango Soup is his delicious version of soups we\'ve had in Vietnam and Korea. It\'s super easy, and topped with candied ginger, cilantro, and a slice of mango, beautiful, too! I very much appreciated the friendly and attentative service from the innkeeper at this B&B. 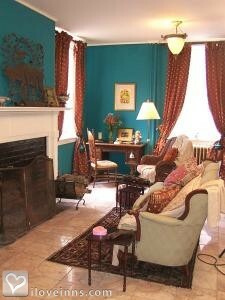 I stayed at this B&B three times, two events, a wedding, birthday party, and one for a romantic getaway. 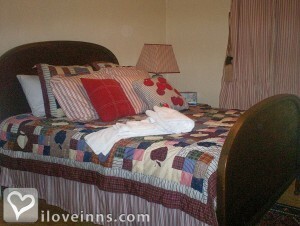 The innkeeper knew of my romantic getaway they made the atmosphere so romantic for me. 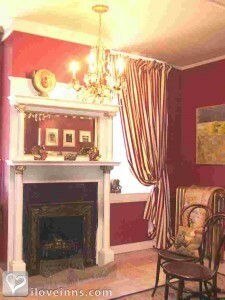 Although my romantic stay was in June they lit the fireplace and had wine for us. Chef Dan cooked an amazing menu for my week stay. The room was attractive, clean, and comfortable. The building is historic, the interior is interesting with a large art collection. Everything worked fine including Wi-Fi. My husband and I attended the October Sky Festival this year for the first time to see his favorite author, Homer Hickam. We had no idea what to expect when we were booking a place to stay just searching the area options on-line, but we knew we didn't want to stay as far away as Bluefield and drive an hour to the festival. 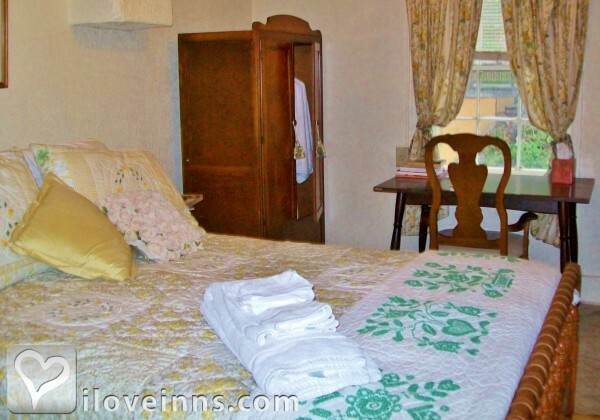 We booked a room at the Elkhorn Inn with a private bath and a train view, and it was not only comfortable but had extra amenities that we didn't assume it would have (e.g., feather comforter). 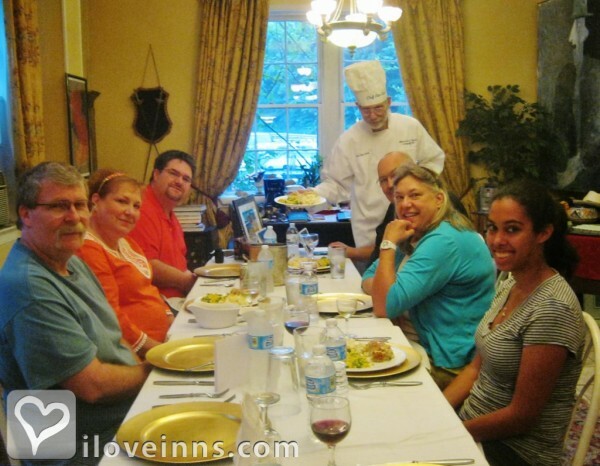 We had dinner at the Inn both nights, and Chef Dan served excellent meals on both occasions! The first night (the night before the October Sky Festival), Homer Hickam stopped by the Inn with his wife and an actor from the movie to visit our Innkeepers. To our surprise, Elisse came up to our room and invited us down to meet them while they were there visiting, and that started our wonderful, relaxing weekend in Southern WV! We thoroughly enjoyed our stay and appreciated their hospitality and good food!! WHAT A TREAT!! My husband and I get away to a B&B twice a year for R&R - He and I both love history and I love crisp linens and beautiful decor. This wonderful Inn has both and so much more. Dan & Elisse are such gracious hosts and patiently answered our many questions about the Inn and the area. They have amassed a wonderfully eclectic art collection (Any piece is for sale:) We also had fun touring the area. DON"T BE FOOLED! WEST VIRGINIA REALLY IS WILD AND WONDERFUL. We rode quads on the Hatfield-McCoy Trails, had massages at a local day spa- (also got one of the BEST hair cuts of my life there)- toured 'the millionare's town' and ate well every where we went. Each evening we could return to the Inn, walk up the walk while the crickets chirped outside, relax with some TV in the "little living room" just for us on our floor or read and relax. WHat a great time. Wish I could go back every summer! My wife and I have stayed up at the Elkhorn Inn with Dan and Elise two times now and are looking forward to the next visit over Labor Day... 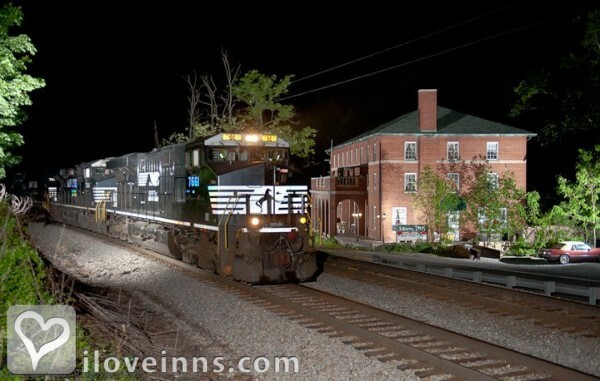 The inn combines history, a great location (especially for railfans), and plenty of time for couples to connect. Combine this with a chance to have a wonderful gourmet meal with Chef Dan and you have a great destination within easy reach of most of the Eastern US! 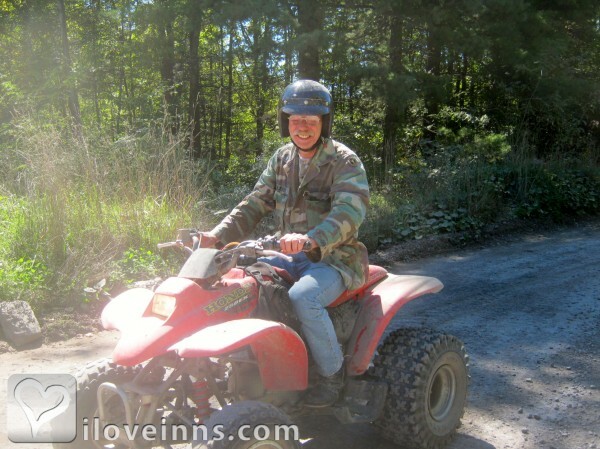 Take an ATV trip with your sweetheart and explore the miles of trails where you can get away together. My wife and I stayed for a second time at the Elkhorn with Dan and Elise. It was even better than the first time. The Food was great, the company wonderful, and the chance to relax perfect. They have wi-fi on the property which is a big plus. If you like trains, this is a great spot to see them. We stayed in the Blue Room which overlooks the tracks. If you happen to visit during peak Blackberry season (July/August) ask Dan and Elise for directions to the secret Blackberry patches! My railfan husband and I enjoyed the gracious hosptality of Dan and Elisse. The room with private bath and view of both the NS tracks and Elkhorn Creek was very comfortable and well-appointed. We also enjoyed the late afternoons on the second floor balcony, giving the railfan a great view of the passing trains. Extremely accommodating and comfortable. 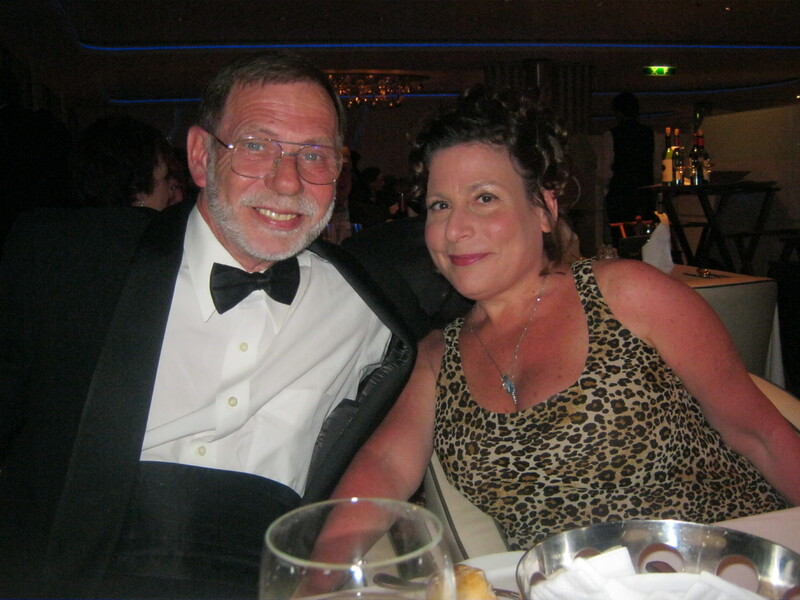 Dan and Elise are gracious hosts and will make you feel like you belong in their family. The B&B is still a work in progress but it is beautiful, nostalgic and pleasant. They provide 5 star quality food seasoned to perfection with freshly their grown herbs. Whatever you love - rugged mountain railroading, history (especially of the coal industry), rugged mountain beauty, charming hosts offering comfortable rooms and excellent food, solitude, ATV and/or fishing, and so much more - all shared with who you love, the Elkhorn Inn is hard to beat. So much of the heartbreak and beauty of the coal industry surrounds you. And two noteworthy movies - October Sky and Matewan - have their origins in nearby Coalwood and Matewan. While it is a 500 mile drive for me, it remains my favorite getaway. This Inn is less than a stone's throw from a busy Norfolk Southern route: The Pocahontas Division. Upwards of 50 trains a day - many hauling coal - may pass by, the ones heading east powered by as many as six locomotives. For the best view - and pictures - book the Greenbriar Room. Next to Hatfield McCoy Trails, Ashland ATV Resort, the Elkhorn Inn has historic railroad museum, art gallery, books signings by authors who visit, the most imaginative gourmet meals to entice the pallette, antiques, railway goes by Inn several times a day and the Inn offers a great balcony view of the passing trains. Hosts Dan and Elisse Clark are the proprietors and have a wealth of talent between the two. Dan is a gourmet chef, Elisse is an artist. Her gallery has not only her work but paintings from all over the US and overseas. I am so impressed by them. They are awakening LIFE in a sleeping little hid away village! Had the pleasure of staying here for the "Dinner in the Dining Car" Weekend with Railroad Historian & Author James D. Porterfield. Such an interesting evening with a delicious dinner prepared by Chef Dan with comments from Jim Porterfield on origin of the recipes. Not being as big of a railfan as many there that night it was fun to see them rush out with cameras in hand each time a train went by. Wish we could have stayed longer to enjoy the area and the rest of the weekend. We had a lovely drive there although we did get lost trying to find the inn. Anyone interested in trains or coal mines and need a place to stay---this is for you!! They've done a remarkable job. Following is part of a letter we wrote to Dan and Elisse Clark thanking them for a memorable stay at their inn. It was a wonderful stay and one that i hope to repeat. Dear Elisse and Dan, Thank you for a memorable stay--I had a wonderful time. You have created a very special and unique place. This was like staying in an art gallery with great food and trains. But the thing that made it really special was both of you and the welcome that you gave me. Thank you. Restore America Radio, WV Film Division "Location of the Month"; "Meet McDowell" McDowell County Tourism Division movie., www.atv.com, www.retreatsonline.com, www.hawk.com, www.trailsheaven.com (Hatfield & McCoy ATV trails), www.byways.org (Coal Heritage Trail).